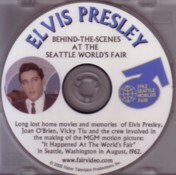 "My time at the Seattle World's Fair and particularly with Elvis Presley has always remained dear to my heart"
In 1962, Seattle became home to two important events: the Seattle World's Fair and as part of it, the filming of Elvis' 13th motion picture, It Happened At The World's Fair. Then aged 21, Albert Fisher, the man responsible for this release, worked in the TV and Movie Department at the Seattle's World Fair. He was given the role of Technical Advisor for the the filming of Elvis' 13th movie, and granted direct access to Elvis, his co-stars, the crew, and shooting of the film. During the weeks of filming, Albert was on hand with his 8mm home movie camera capturing Elvis and others "off camera". The fruits of that footage are now available, having been transferred via high quality digital tape to the DVD format. The result is an absorbing documentary account of not only Elvis, but the Seattle World's Fair itself. With very little candid footage existing of Elvis "off stage", Albert Fisher's video images are a most welcome and important historical record of an informal Elvis Presley...Elvis the man, not necessarily Elvis the performer. The footage on display includes Elvis, Colonel Parker, Red West, young Kurt Russell, an even younger Vicky Tiu, Joan O'Brien, the impressive Space Needle, director Norman Taurog and Bitsy Mott. There is also footage taken by Albert Fisher of the closing scenes of the movie. There are many amusing anecdotes told throughout the documentary and a neat trick is revealed on how, during filming of It Happened At The World's Fair, people were made to look skyward as if they were looking at the famous Space Needle which had been built as centerpiece for the Fair. While watching the DVD we learn plenty of interesting pieces of information. How many of us knew Vicky Tiu went on to become the First Lady of Hawaii or that the Belgian waffle was introduced to Americans during the Seattle World's Fair? And how many of us knew that Elvis presented the Governor of Washington with a ham, that's right, a ham, from Elvis' own farm? And here we get see the footage of this rather unusual presentation. There is also an interesting photo montage with stills of some of the visitors to the World's Fair. They include Richard Nixon, astronaut John Glenn, singing cowboy husband and wife, Roy Rogers and Dale Evans, French star, Maurice Chevalier and England's Prince Philip. Considering the relatively primitive nature of home movie cameras in 1962 the color footage is surprisingly good. At times it is dark, cloudy or jerky with some specks or other imperfections, but overall it is very watchable...and you will want to watch it! As home movie cameras didn't have audio in 1962, a very pleasant overlay music soundtrack has been added. A strength of the documentary is its very smart and tight editing which offers the viewer a well constructed look at both the Seattle World's Fair and Elvis' involvement in it. Some reviewers have been critical of the relatively high price for this release which has a running time around 28 minutes. However, what price do we put on rare Elvis footage with important historical significance? 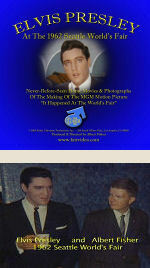 Signed and numbered DVD with Certificate of Authenticity (COA) plus 4 full color never-before-seen photos of Elvis Presley at The Seattle World's Fair in 1962 with Col. Tom Parker, actress Joan O'Brien, actress Ginny Tiu, and others. Verdict: With its rare historical footage, 'Elvis Presley Behind-the-Scenes at the Seattle's World Fair' is one of the more important DVD releases in recent years. Kurt Russell, who played the young boy Elvis hires to kick him in the shins, went on to enjoy a highly successful TV and movie career. 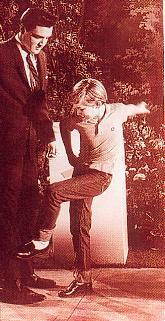 After starring (along side Charles Bronson) in the TV drama, 'The Travels of Jamie McPheeters' , Kurt became one of the Walt Disney Studios most successful teen actors. As an adult, Kurt was critically acclaimed for his portrayal of Elvis in the 1979 John Carpenter biopic, Elvis. He would again don a white jumpsuit in the violent Vegas heist film, 3000 Miles To Graceland. (and most recently another Disney production) 'Sky High"